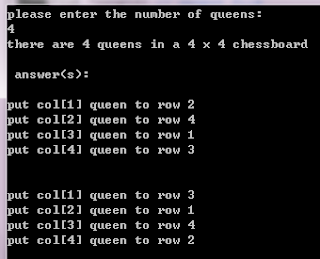 The n queens puzzle is the problem of placing n chess queens on an n*n chessboard so that no two queens attack each other. * so that no two queens attack each other. #define statmsg "there are %d queens in a %d x %d chessboard\n\n answer(s): \n\n"
#define ansmsg "put col[%d] queen to row %d\n"